As a reviewer there are always those authors who you look forward to and Jeff Vandermeer is certainly one. His particular, and often peculiar, look at the world results in some of the most thoughtful and challenging science fiction being printed. In his most recent novel, Borne (2017. 323 pages), Vandermeer places us in an unnamed city sometime in the future after the world has torn itself apart in a conflict which is never fully explained. What little we can gleam is taken from the memories of the books protagonist, Rachel and even she is uncertain about many parts of her life as she has selective amnesia. Within the nightmare that is the broken city, Rachel works as a scavenger, locating the food and drugs she needs as well as any biotech that she can find. This is a world where biotech has reached a high level under the auspices of the Company. For a while the city remained safe, but when we first meet Rachel all of that is gone, the Company has failed, even if it still existed, its biotech creations hunt through the city killing any humans they find. The last and most destructive biotech is Mord, a whale of a brown bear, who is able to fly and considers the city his domain and the inhabitants merely food. Brave and resourceful, Rachel is skillful enough to get close to Mord to scavenge anything which might fall off him. On one particular day she comes across a most curious item, sure that it is some form of bio ware, but unsure whether it is plant or animal, she takes it home to the refuge that she shares with Wick. As time passes it is obvious that whatever else Borne may be, it is sentient. The book uses the growing relationships within the refuge and the growing threat from without to explore a number of thematic ideas. The first explores the nature of identity. Borne wants to know if it is a person, which is a more difficult question to answer in a world where flesh and memories can be remade and rewritten, it creates a fluidity in the characters which becomes an important plot point. The book also examines the nature of memory, secrecy and the duality which often happens both between couples and people in general. We show only those bits of ourselves which we wish other to see. Rachel complains often that Wick is hiding secrets from her, he refuses to speak about his past and the nature of his work in the Company, but she too keeps secrets from him, especially about Borne’s growing abilities. The only character that does not initially do this is Borne, who has no moral compass except for Rachel, but in observing Rachel and Wick Borne learns to lie. 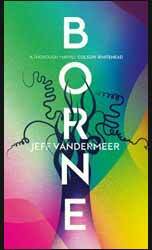 Now, I can see how a story about a city being terrorised by a giant brown bear and the growing relationship between a broken woman and an upside-down octopus may seem farfetched, but Vandermeer’s use of language and imagery and his focus on characters means that he ends up pulling the whole thing together to make for a very satisfying read.